Update: Reinforcement of our team! At the beginning of March three marketing students of the University-College UCLL began working for Wanted: Food for the Future. 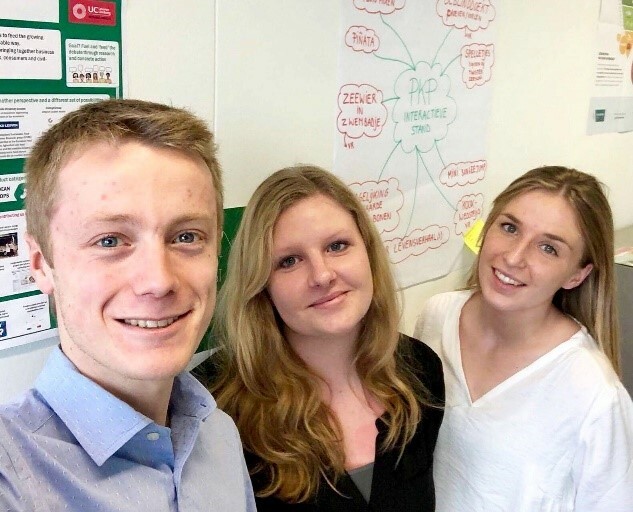 Julien, Kelly and Lauren will further develop the Food Lab and how it could be used to reach out to a larger audience, and how it could help provide a platform for debate with the consumer. This creative challenge builds upon the work of their predecessors and they seem like the perfect people to get the job done. For several years I’ve become more aware of the ongoing global problems concerning the climate and overpopulation. Through this project and my background in marketing I can actively help with raising awareness among younger people. It allows me to enhance my current set of skills while contributing to society and the environment. During the next three months the Food Lab will be present at numerous events to reach out to youth about the future of our food. Julien, Kelly and Lauren are looking for new interactive ways to help spread the word. During these events they will aim to stimulate the debate with consumers. At the moment they are not sharing how they will do it, but the initial proposals look very promising. It is also a good opportunity for Julien, Kelly and Lauren to put everything they’ve learned so far into practice. I’ve always been somewhat preoccupied with healthy food and the products I eat. Besides that, I want to do my part in society for a better, more sustainable future as I’ve been well aware of the current situation. This project seemed like a good way to get involved. Best of luck to Julien, Kelly and Lauren!